Within few days, Diwali is round the corner which is celebrated in all parts of India with full enthusiasm and fun. 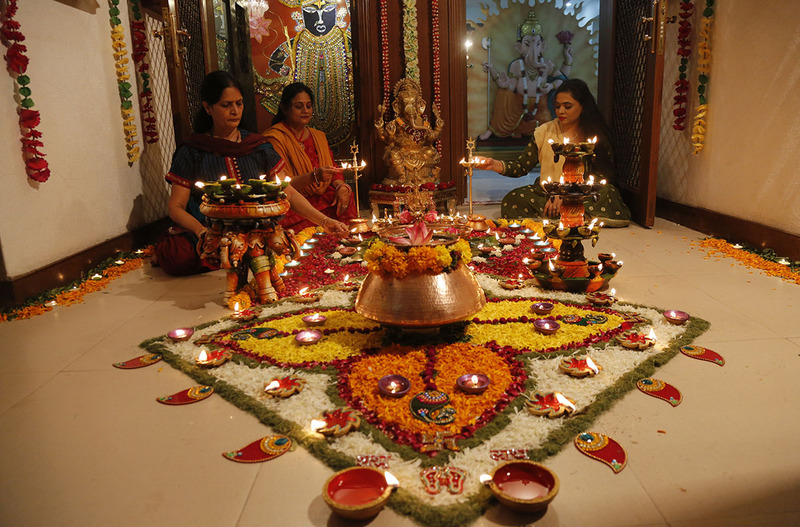 Wearing traditional attire, making rangoli designs, lighting diyas or lamps, variety of sweets and worshipping goddess laxmi are enjoyed everywhere in India. Though, it is not possible to catch the glimpses of every place during Diwali, thus we are mentioning few places where your Diwali celebration will be worth. Celebrating Diwali evening in Haridwar and Varanasi can be a good idea. As the sky get darker, people gather on ghats and floating diyas in the rivers. Witnessing thousands of diyas floating in a river will mesmerize you. The display of fireworks , aarti ceremony and chanting mantars add more ambience in the atmosphere. The Golden Temple in Amritsar looks beautiful and charming when dressed with lighting. The temple is decorated beautifully with colorful lights. Sikh celebrates Bandi Chhor Divas on Diwali which commemorates the return of Guru Hargobind Ji from prison. People float diyas in the sarovar and one can feel the peaceful and spiritual ambience with the back ground of eco of Kirtan (prayer). Though there is nothing different in Mumbai from the other parts of country, but the eye-widening views of sky are worth watching. Fireworks in the sky will win away your hearts. The best place to catch the glimpses in Mumbai is Marine Drive where sky is flooded with glittering and sparkling fireworks. Entire Jaipur is beautifully decorated with lighting and lamps. Especially, the walled city and shops are lighted in different styles and patterns. By booking Rajasthan Tour Package, explore the Shopping Exhibition where small and large shops are gathered at one place. There is a large number of items to choose for customers. There are several eateries, swings and activities for people to enjoy. Luck Draw, performances and shows also take place. This is also the best medium for SME to launch the products and reach the customers. Kolkata celebrates Diwali by worshipping kali mata and performing pooja. Many huge and colorful pandals are made during the Navratra which are worth visiting. A day before Diwlai, entire city is soaked into the candle lights, diyas and lamps to celebrate the beginning of this festival. To discover the Indian culture and traditions, you can also join the Diwali celebrations of any family and see how how they celebrate with fun and full of enthusiasm. Wear traditional attire just like you are wearing for any wedding. Women can wear saree and men can wear kurta pajama. During Diwali, its is better to experience homestay rather than staying at hotel to know and see the Indian culture closely. You can also enjoy gift giving like chocolates and sweets to the people around you. In India, locals love to exchange gifts while wishing them Happy Diwali! Diwali is the best time to enjoy the shopping at the best discounted prices. Special Diwali fairs and markets are organized to attract tourists. Places like Dilli Haat, Dastkar festival, Diwali carnival can be visited within Delhi Sightseeing. You can also experience the Diwali mela at the Blind School and share the happiness with blind children. This is the most satisfying happiness that one can ever have. In India, every part of India is full of lights, diyas and lamps. Floors are decorated with colorful patterns. Plan your trip to India during Diwali to see the culture closely. Book your tours in India with the Trip Planner India and this Diwali have all the fun and enthusiasm during the celebrations.